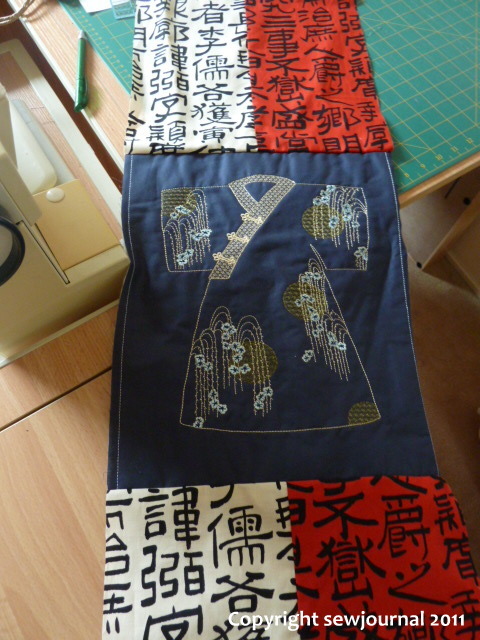 I’ve finished the top of the Kimono quilt. Thank you all for your supportive and positive comments. Now I’m working on the back. Yesterday afternoon I managed to piece in this large, embroidered kimono block that was also a birthday present from one of the sit and sew ladies (thanks Leslye). I have used half cream and half red and then I will piece some more cream onto one side and some red onto the other and that will do for the back. What do you think? Last night I also did some more quilting on the Applique Sampler. It’s almost finished! Nice. You are going great!